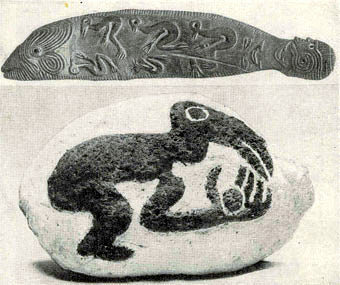 References to the strange bird cult of Easter Island are numerous in the native art. A remarkable example is this strange representation of the bird man holding an egg in his hand carved upon a block of stone, itself egg-shaped. The wooden club above represents the fish man, but the blade of the weapon is adorned with numerous figures of the bird man in various attitudes.